Bank of America Corp, the second- biggest U.S. lender by deposits, dropped plans to charge a $5 monthly fee for debit cards after a nationwide backlash from customers and lawmakers. 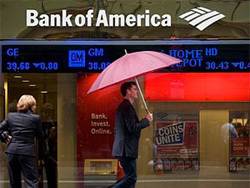 Bank of America reversed course after competitors including Wells Fargo, the No. 2 debit-card issuer, decided not to charge similar fees. Atlanta-based SunTrust Banks and Regions Financial Corp., based in Birmingham, Alabama, said yesterday they will eliminate their check-card fees after customers rebelled. It’s very hard to sell a product when your competition is giving it away from free. Most banks don’t charge such fees, and don’t plan to. What would BOA offer that is worth a $60/year premium over most banks and credit unions. Chalk one up for the consumer! I wonder what scheme they will come up with to charge money. I still don’t blame them too much. They were really done in by the democrats.